The young people of today enjoy Brussels sprouts, apparently. 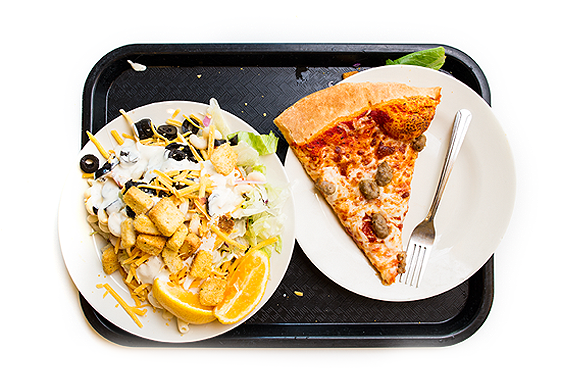 When we came up with the idea of capturing what UChicago students eat in the cafeteria, we had, perhaps, slightly antiquated ideas of campus eating behavior. We envisioned trays laden with gleefully clueless decisions that only those with great metabolisms and a lot of steam to blow off can make: quadruple-stacked hamburgers, dessert for dinner, flavor combinations that would make a gourmand cry. Times have changed, however. 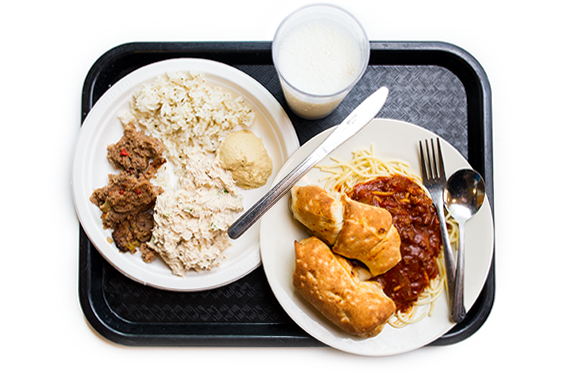 First of all, we needed to change our working title “What’s on Your Tray?” to “What’s on Your Plate?” since UChicago Dining has downplayed the use of cafeteria trays in order to save dishwashing water. 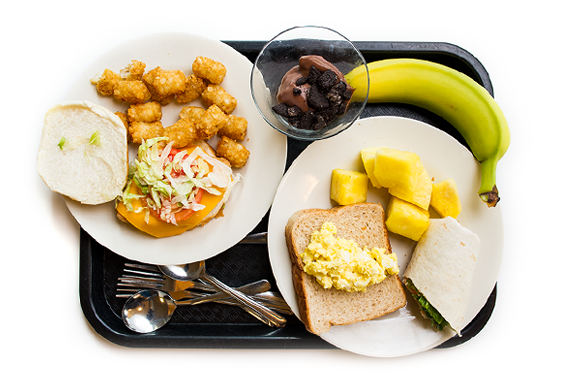 Trays, while still available, are out of the way and no longer a staple of the cafeteria experience. In his 20 years at the University, UChicago Dining executive director Richard Mason has seen a significant expansion of the salad bar (“It was iceberg lettuce only, and much smaller than it is now.”); more transparent food preparation (“All the food used to be cooked out of sight and then served to people.”); and a wider array of global cuisine (“All Asian food used to be called ‘Chinese food’; now we have sushi, Thai, Vietnamese, and Korean.”). “There’s more knowledge now about cooking,” Mason says, crediting cooking shows and a larger selection of off-campus dining options contributing to students’ culinary sophistication, as opposed to the “comfort food” of 20 years ago. Entering Arley D. Cathey Dining Commons, it’s clear the path of least resistance is one of health and mindfulness. Diners are first greeted with a fresh salad bar, with hamburgers located in the back. Fresh fruit and cucumber-enhanced water are available alongside soda, coffee, and tea, with inspirational quotes decorating the dispensers. 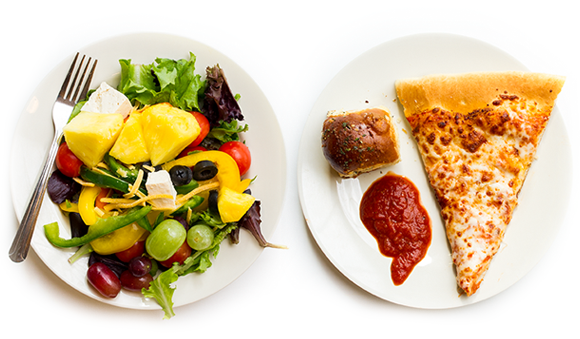 Actual human beings are on hand to dole out the daily entrées in attractive, reasonably sized portions. 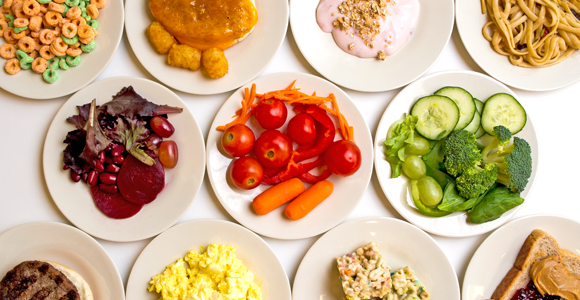 Vegetarian, gluten-free, kosher, and halal options abound. 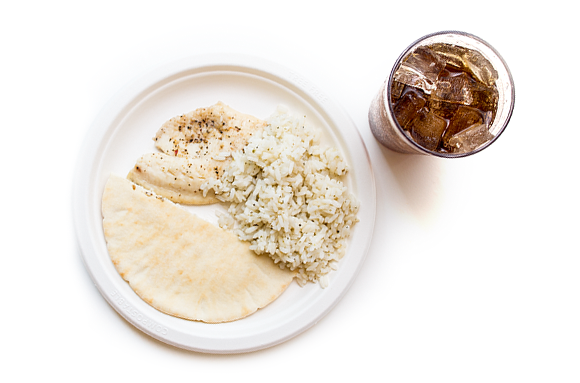 Each entrée’s ingredients, calorie counts, and potential allergens are clearly displayed. Desserts are distributed in petite servings (which Mason says are more enticing than, say, a big plastic bowl with pudding glopped into it). And nearly all the students eat accordingly. During the lunch rush at Cathey, a lot more Brussels sprouts were consumed than we ever would have predicted. We’d be lying if we said we weren’t the teensiest bit disappointed that the food choices we witnessed weren’t more “creative,” but these are more sophisticated, health-conscious times. And if anyone is disappointed in how UChicago students eat, it certainly won’t be their parents. 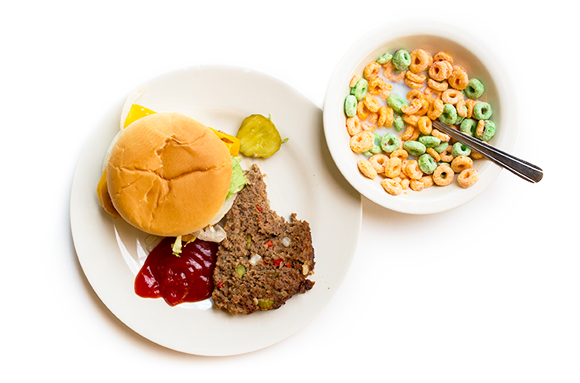 A third-year law student chooses meatloaf with a side of Apple Jacks in between classes (the Law School neighbors Burton-Judson, which connects to Cathey Dining Commons). French fries are still a cafeteria mainstay, but they are often substituted with sweet potatoes, waffle fries, or, pictured here, tater tots, which are also popular. Selections like these are made by Mason and his staff four weeks in advance. 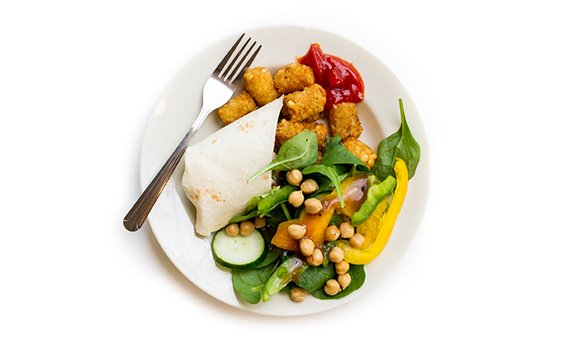 With options such as tofu salad and cheese pizza, it’s easy for students to take advantage of “Meatless Mondays,” an endeavor supported in October by the Office of Sustainability. “This is just the second part of my lunch,” clarified the law student who was craving cereal. Several students who carried desserts wanted it to be known that was not all they were eating. The art-history-studying first-year who created this plate wore a streak of pink in her hair and said the all-beige hue of her plate was just a fluke, not a deliberate aesthetic decision. 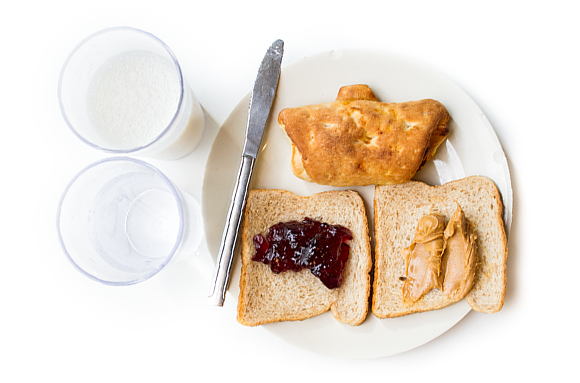 An econ/geography second-year from New Jersey chose peanut butter and jelly because there was “no line” for it and a mini calzone because he missed his grandmother’s Italian cooking. 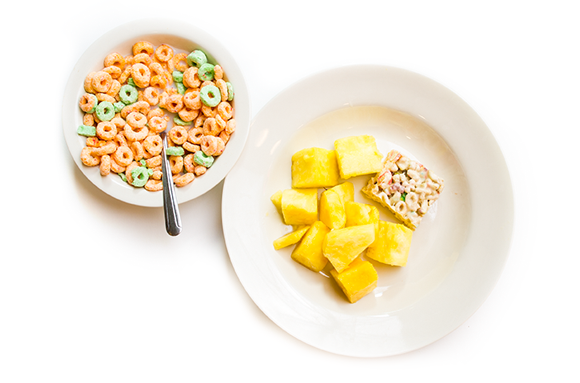 Food choices at the Arley D. Cathey Dining Hall run the spectrum.